In the next six years, Enterprise Blockchain revenue will cross $20 Million. Blockchain, especially in its role as Enterprise Blockchain has become a controversial phenomenon, with both the class of believers being on two very different platforms – One believing that Blockchain will change the mere atom of Enterprises in which it is implemented and the Other saying that it is a poison that will consume all and give no returns. But, no matter what the naysayers say, the reality of today is that Blockchain is seeing a shift in momentum from being a Proof of Concept to being a technology that is practically helping business get more efficient at base level costs. At this hour, blockchain is sitting at a point of inflection, with the momentum now shifting from the concept to blockchain tourism to the development of business applications. A happening that can be seen in the number of enterprises, across the world looking to invest in replacing their existing systems with Blockchain. The replacement that businesses are planning to do in their processes is the doing of a number of perceived benefits that they think Blockchain will bring in the Enterprise ecosystem. Benefits that we have discussed in great details in our Blockchain Guide for Entrepreneurs. The many Blockchain uses in Enterprise ecosystem are drawn at the back of the seamless placement of Blockchain features in the loopholes and gaps in the enterprise problems. In an enterprise setup, it is usually believed that everything from compliances to communication should be done through a centralized route. However, by incorporating a decentralized mechanism, usually referred to as the Blockchain of Things, in the enterprise communication and compliance mix, your enterprise could not just bring all the communication and compliances in permission, tamper-proof system but also give a provision to the enterprise to function in a system that is unhackable. The fact that Blockchain operates on immutability mechanism, making it impossible to change what once gets fed into the blocks, makes quality and correctness paramount. In a sans Blockchain enterprise world what happens is that quality becomes a matter of multiple to and fros, something that leads to not just a delay in time of delivery but also an end result that comes with no guarantee of quality of even alignment with what was originally required. But, when the enterprise works under the pressure of their data getting locked in the system, the probability of completeness of information and quality maintenance automatically increases. The fact that Blockchain brings out everything in the open leads to injecting an entirely new wave in how responsibly the employees and stakeholders act in the business. The transparency functionality that the technology comes with makes it impossible to slack on any task for every process and transaction is surfaced in the open for everyone in the permissioned blockchain to see. One of the most popularized benefits of Blockchain technology both in an enterprise world and off it is the advantage that comes tagged in the face of cost saving. Through its multiple offerings like smart contracts, decentralization, and even transparency, Blockchain in one way or the other introduces the enterprise world with some serious cost saving elements by saving them from putting money behind verification, tracking genuinity of goods, seeing the quality of service offered, etc. The Blockchain features and their impact on an enterprise setup that we just saw hold true only until the time when the Blockchain Enterprise solution that you have invested in and implemented in your organization is good enough – a point that we have detailed in our Digestible guide to Blockchain App Development. On that note, next, we are going to look at the requirements that make up for a good, well-planned Enterprise Blockchain system. Blockchain, when looked at in the public system versus when operating in an Enterprise ecosystem, shows a completely different picture. And the differences are not just in the face of the Blockchain use cases in the enterprise but also in terms of the specifics that are demanded in terms of features or requirements. Unlike Public Blockchain, which calls for the data to be available for the world to view, in case of Enterprise Blockchain and the rules and compliances that revolve around how businesses can use data and information, the picture is different. For use cases of blockchain technology to emerge, it is important that the mechanism followed is based on permissioned viewing. The technology when operating in a business setup should only allow viewing of the information to the authorized stakeholders and not everyone in the company and the world. Although very closely related to Privacy, the security functionality is also very different in the case of Enterprise Blockchain as compared to the Public Blockchain system. Elements, like Know Your Customer or Anti Money Laundering, which are otherwise optional in a public blockchain system, becomes on the face important when the setup in question is that of an enterprise. While Blockchain in itself comes with the promise of heightened security and hack-proof system, when the data and information is something as private as that used by enterprises, it becomes almost mandatory to ensure that extra levels of security are added in your blockchain for business setup. Amount of transactions per second happening on Blockchain also varies greatly between public and permissioned blockchain system. While in case of public blockchain the number of transactions is generally more scalable and the need to scale with respect to the nodes which can participate in a consensus protocol is higher, the throughput time is lower. But, since Enterprise Blockchain works exactly opposite of it, blockchain app developers are expected to keep the throughput time to an absolute low. For an enterprise, irrespective of what the revenue size is, saving operational costs is hands down one of the most important elements. Businesses prefer working around an operational cost that is not just low but also predictable. And so, it becomes an important side note that the Blockchain enterprise application should work on a cost-effective platform which works on stable, predictable transaction fees. The requirement set that we just talked about has created an influx of demand that the Blockchain industry has abided by them in offering Private and Permissioned Blockchain platforms that are devised around these enterprise requirements and demands. The platform works at the base component in the development of a majority of the decentralized applications operating in the market today, especially in the Enterprise setup. The reason behind this trust that the Blockchain world is whole-heartedly passing in the Ethereum direction is the plethora of benefits that the platform offers – Security & Safety, Stability, Zero Downtime, and Corruption Prevention. 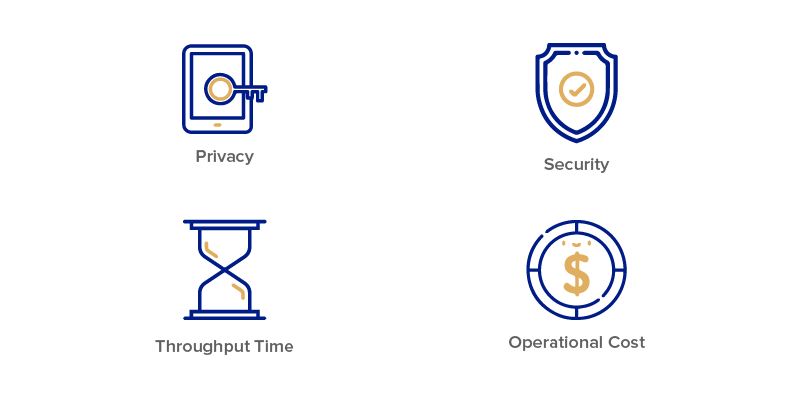 The permissioned network gives businesses the ease to register users by offering transaction authority and identity access, which defines a wide area in which the users can then work and which would require new users to take permissions. 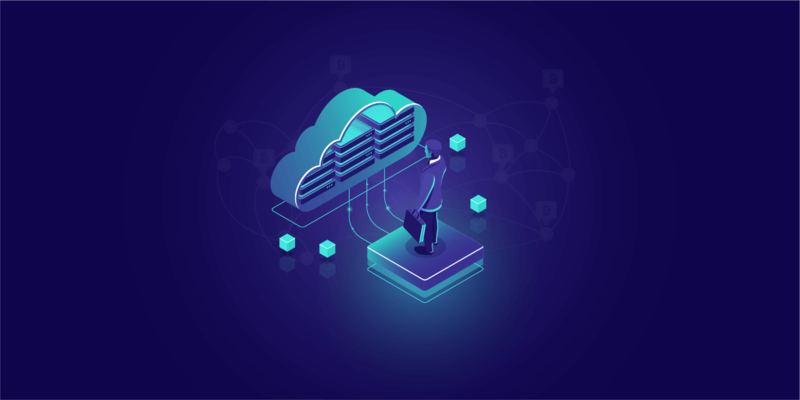 The platform comes with the functionality of data partitions allowing enterprises to save data that is otherwise considered sensitive because of the several law implications. The Ethereum based enterprise based permissioned network supports both private and public form of transactions. It is considered to be ideal for the development of apps that demand quick processing and fast speed of private transactions off the blockchain ecosystem. The platform which is considered to be on an ever-evolving mode has become a part of the Blockchain journey of a number of industries, which are not just restricted to Finances. The market growth that we saw above, the fact that Blockchain’s features fit like a glove with the Enterprise setup and help in building business case for blockchain, and the rising number of platforms making it possible to develop enterprise blockchain solutions – all together are hinting towards one thing – Enterprises are no more wondering if they should employ Blockchain technology in their processes but are rather looking at the different ways of incorporation. The adoption that technology is witnessing in the enterprise world is only poised to grow further in 2019 and beyond. Especially when more and more enterprises are looking to increase their investments in the Blockchain technology adoption. We have several reasons to back why we think 2019 is the best time to invest in Enterprise Blockchain. Stay with us as we look into the next. While Oracle, IBM, and Amazon are already offering enterprise specific Blockchain solutions, R3 – the Blockchain consortium is also in plans to unveil Enterprise Corda this year. The appeal of enterprise level DLTs lies in the fact that it offers less thought of collaboration opportunities not only between tech companies but even cross-industry brands. There are already rounds of collaboration happening between companies like Nestle, Walmart, Unilever, etc and IBM to set up food tracking system based on Blockchain technology and in 2019, the numbers would only grow. The absence of a connectivity system between two or more Blockchain solutions has been the biggest problem of the technology that is yet to see a wider adoption level in the market and is yet to offer what one can call blockchain real use cases. But, the roadblock is now slightly getting sidelined. More and more tech companies are now coming up with ways to establish a connection between ledgers. Like for example, Ripple has launched an Interledger, mainly for the financial industry, which is a mid-ware arbitrary protocol which can link multiple ledger types – both centralized and distributed ones. The interledger can also allow the users to store the aggregate transaction data off of a public Blockchain with the help of a connector for transferring funds between the private versions of Ripple Network. While Ripple is just one example, there are a number of other interledgers that are prepared to be launched in 2019 to make interoperability even much easier. 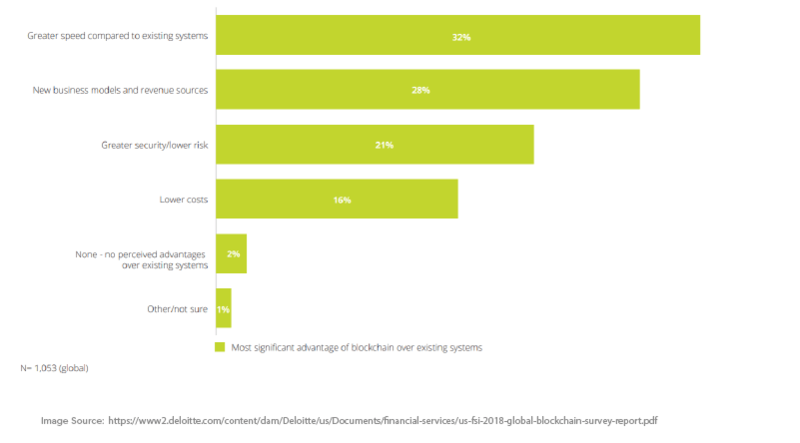 According to a survey conducted by Deloitte, there are only 18% respondents in the whole of the USA who see Blockchain as money database brought into existence for supporting cryptocurrencies having application outside the finance sector. Rest, everyone knows that Blockchain beyond cryptocurrencies is a wide world. 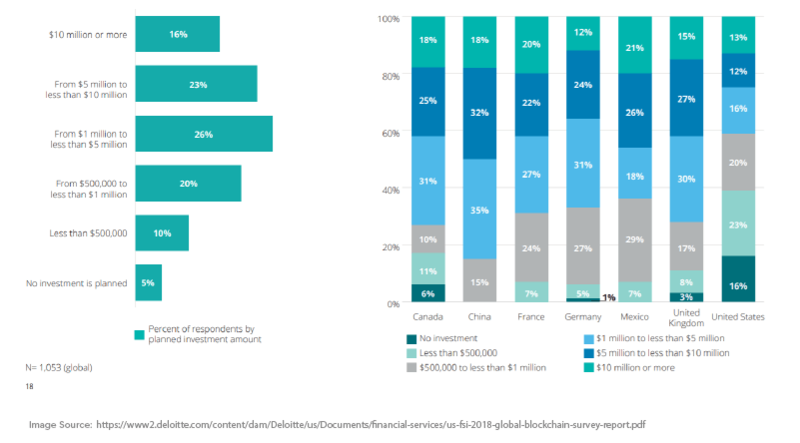 The survey continued to explain how more than 74% of companies already have one or the other compelling use case for Blockchain in their business and over 34% have already introduced Blockchain in the process. 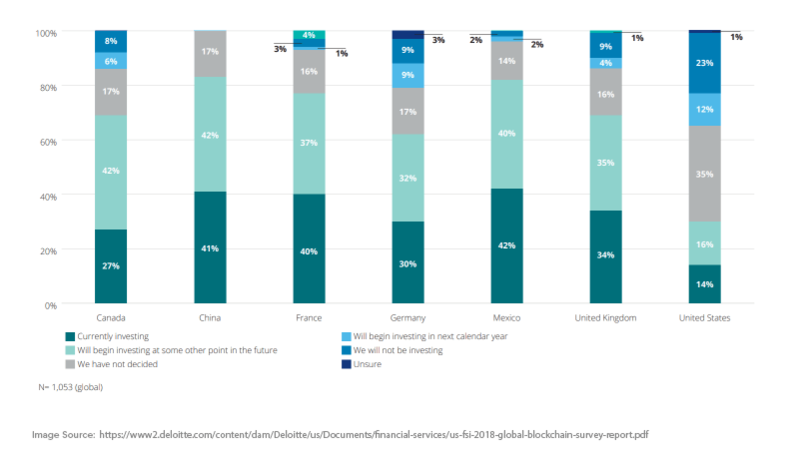 While these statistics showing a positive Blockchain sentiment were of 2018, the years from 2019 and beyond will only see greater adoption of Blockchain in Enterprises over time. The 2019 outlook of Blockchain in the Enterprise domain and in the world, in general, is on a growth trip whose steep is pretty high, proving that blockchain technology use cases in the enterprise are a number that is going to rise. The demand for the technology’s adoption is also poised to keep growing over time and prepared to grow with it is the number of enterprises looking to adopt the technology in their business processes. Now although since the past 10 minutes we have been trying to pass the impression that Blockchain technology is what an Enterprise needs and while this is true, it is not absolutely necessary that your enterprise should also aim to be an industry disruptor. There are enterprises that even today, when the world is looking for ways to integrate the Blockchain technology in the processes, are not quite sold on the idea of its incorporation (majorly because of the challenges associated with the technology’s adoption in enterprises, which we will look into later). For those on the fence entrepreneurs, here are 11 questions passed on by world economic forum that will help answer whether or not they should invest in Blockchain. Now, since you must have gotten an idea of whether or not you should integrate Blockchain in your Enterprise processes, the point that we want to highlight here is that while you might belong to the side where it is not necessary to invest in Blockchain just yet, there will come a time when it will become an absolute necessity to define which business is outdated and which is moving with time. A time when the world will be filled with Enterprise Blockchain use cases. So, while it is not mandated to implement Blockchain in your enterprise today, at this moment, doing it would, in fact, give you far greater plus points in how your processes flow and what overall image you leave in the industry. 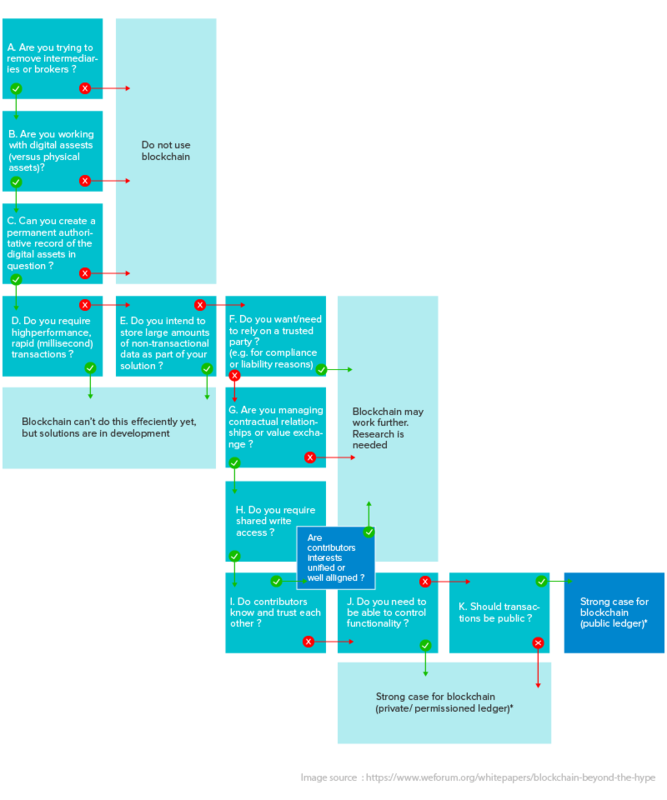 To give you an idea of the present day scenario, here is the industry wise Blockchain business case of the technology’s adoption picture as seen to be operative around the globe. The history of the Blockchain and Finance industry goes far. And so is the Impact of Blockchain on FinTech. And the journey has only been advancing through precisely managed pilots, tests, and POCs. Brands like RBC, Santander, JP Morgan, BNY Mellon, Citibank, Visa, American Express, Goldman Sachs, and MasterCard, amongst others are conducting various blockchain-specific efforts along with having multiple internal working groups focusing single-handedly on the blockchain technology. The examples of Blockchain trade finance use cases are not restricted to these but are expanded to a much wider spectrum. Auto manufacturers have realized that the complete essence of the mobility industry is altering. Everything from autonomous vehicles, ride sharing, and electrification has become an entrant in the industry that is changing the traditional mobility world. In the face of all these changes, a number of automotive companies are now planning to enter the Blockchain world to play a participating role in mobility reinvention program. Talking of brands using Blockchain technology use cases in enterprise revolving around redefining of mobility, two names have emerged on top of various others – Volkswagen and Renault. Both the brands led their PoCs back in 2017 for testing the tracking of vehicle telematics. Specifically talking of the enterprise level use cases for Blockchain in the automotive industry, the mileage data of the vehicle, its engine usage history, and repair history, among other things, can easily be captured on Blockchain for the dealers, manufacturers, and sellers to know with 100% accuracy. Airbus, in 2017, conducted a Proof of Concept with Blockchain technology at Berkeley for the tracking of jet plane’s parts. And in 2017 itself, KLM started working with Blockchain consultancy to help develop blockchain-specific prototypes. In addition to it, Lufthansa is also testing a blockchain-based application for users having Winding Tree, plus Air France is looking at a distributed ledger technology for the supply chain mechanism for tracking workflows in the aircraft maintenance system. The retail industry, when it comes to Blockchain, is one of the most concentrated on the technology industries. For ultimately, the industry gives a high scope to the technology to work around supply chain management. An example of Retail industry’s blockchain adoption can be seen in the case of Walmart – the brand that is trialing usage of blockchain for tracking the origin and movement of porks in China. Alibaba also in 2017 declared how it has been working on the development of in-house based private blockchain network for tracking the authenticity of the product in the supply chain and for reducing the number of counterfeit goods from entering the system. So here were the industries examples/ Blockchain use cases in Enterprise that are prevalent in the market today. Now coming back to what we promised you a while back, let us get you acquainted with slightly another side of the coin – the challenges that Blockchain will have to overcome to become prevalent in the success story of all the success stories around the globe. Companies when looking at adopting Blockchain on a mass scale, get faced with a number of challenges and internal barriers that keep them from delving deeper in the technology and invest in it on a complete level. From defining their own blockchain uses in enterprises. All these added to the fact that some of the most robust Blockchain platforms are still giving unfulfilled promises on the state of scalability and security and the shortage of people having in-depth knowledge of the technology is something that is together holding back enterprises from completely adopting Blockchain system and finding use cases for Blockchain that works for them. Now even if you remove the technical and regulatory blockages from the picture, the other major problem associated with the widespread adoption of Blockchain uses in Enterprise comes with is reorientation. The stakeholders that business generally deals with are people who have less exposure to the technology might show resentment in shifting their business to the technology, something that can further lower the process of complete decentralized transformation. Even though these problems are those which are too hard to ignore or not think of when scoping your enterprise blockchain dreams, it doesn’t translate into the fact that they don’t have a solution. We have the solution. With this, you are now updated with how the Blockchain use cases in the enterprise are ready to change entire businesses and how the enterprises are reacting to it, which now brings us to the parting note. Developing and then deploying a Blockchain solution for your enterprise can be much larger a work that a business can achieve without the help of a team who excels in it. Discover how Appinventiv Blockchain program can help build a Blockchain Enterprise ecosystem that in returns helps in making your business or simply its core process decentralized. Get in touch with the team that decentralizes enterprises. “How Much Does it Cost to Develop a Cryptocurrency Exchange App like Coinbase?,�? “Why do ICOs Fail? Are They Still Worth Investing in 2019?,�? “Blockchain For Startups: The Secret to High Efficiency?,�? 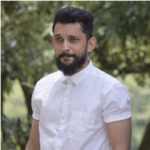 Chirag Bhardwaj, in his role as an ICO consultant, has proved himself to be someone with a wealth of knowledge and expertise in architecting and developing smart contracts (solidity), ICOs (using ethereum platform) and blockchain applications. A C++ developer with a higher appetite for innovations, he keeps himself abreast with the latest update and ways to deal with complex situations in the mobile environment. When not coding to add another wonder to the mobile world, you will find him contributing to the white paper writing and exploring Stack Overflow.